Many instructors prefer the simplicity of phoning in recordings of their lectures with a device that is familiar to them and simple to use. They do not have to worry about extra equipment and software and can bypass the multi-step process of recording with a microphone, saving the recording as a MP3 file, and then uploading the file to a podcast server. Drop.io is one of the easiest solutions to creating phone-in recordings that are almost immediately converted to podcast episodes. The first 100MB of audio lecturecasts is free, which is equivalent to approximately 400 minutes of recording time. If lecturecasts are designed for 20 minutes of delivery, then approximately 20 sessions are available. Pre-recorded lecturecasts can be uploaded separately as part of the podcast. 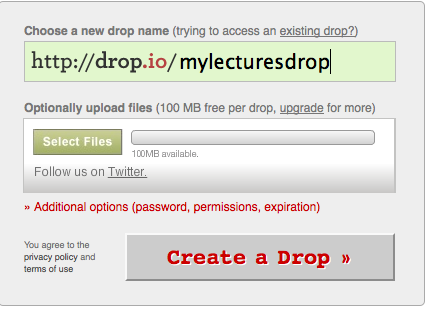 Go to http://drop.io and create a new drop name that is appropriate for your course and has not already been taken (e.g. mylecturesdrop). Click the Create a Drop button. Type your e-mail address that will be associated with your new drop and then click the Done button. Log on to your e-mail account and retrieve your initial Admin password, which is sent by Drop.io. Enter your new Admin password and then click the Access This Drop button. Click the Access Control tab in the left sidebar and choose Admin Password. Enter your new password and take note of it. Choose Guest Password under Access Control and enter a Guest Password for your students. Click the Guest Permissions tab under Settings and leave only the comment, chat, and download settings checked. These settings allow your students to subscribe to your podcast. 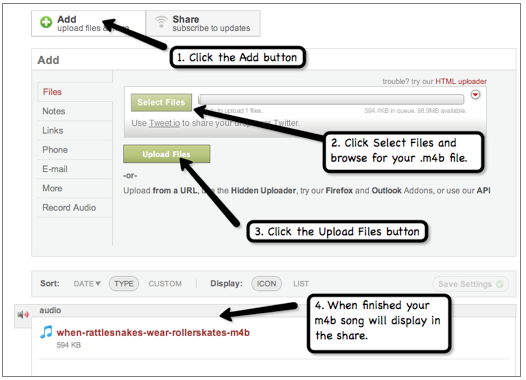 If would like students to contribute to your podcast by uploading files, then check the box Guests can add. Students can also contribute if they know the phone-in number and extension or the Drop.io e-mail address. Click the Return link to the right. Under Customize Sidebar > Voicemail click the link Create a free number that you will use to phone in your recording. Dial the number and extension and when prompted record your lecture, making sure to speak distinctly. When finished simply hang up. Your recording is immediately saved to your Drop with a filename such as voice-message-friday-13-aug-01-05am-gmt-mp3. 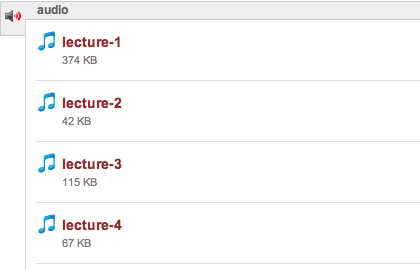 Click the More button to the right and choose Rename to type an appropriate name for your lecture. Repeat the process as needed until you have completed your lecture series. Enter the Guest or Admin password as prompted. Choose Share > Share Via Dropcast, which will immediately open iTunes and create a podcast with the name "sharename Dropcast" (e.g. Mylecturesdrop Dropcast). Click Input/Output Settings in the left sidebar. Note! The Account Login and Passwordboxes in the upper-right corner of your Drop.io page is only for administrators of multiple accounts and does not apply to individual drops. Prerecorded audio files can be uploaded in addition to your phone in recordings. Click the Add button and follow the steps in the figure below to upload your audio file, which is typically .mp3, .wav, .m4a, or .m4b. What Can Be Done About Childhood Obesity?